This is the thirty-first installment of the monthly classic actress beauty tips that I have read about and tested. Jennifer Lopez, Britney Spears and Taylor Swift. These celebrities may not have a perfume named for them if it wasn’t for English born actress Elizabeth Taylor. The two time Academy Award winning actress is known for her violet colored eyes, glamorous beauty, love of diamonds and multiple marriages. 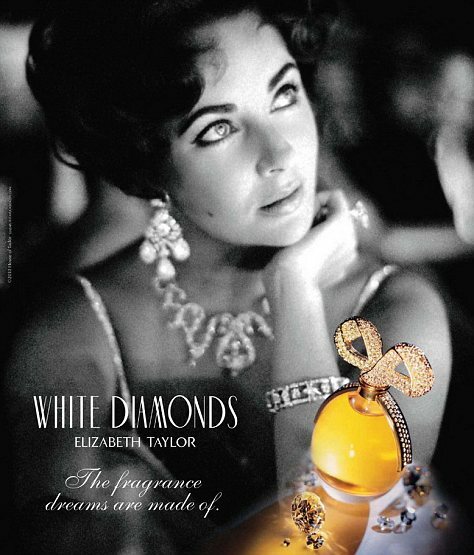 With a mix of her affair with jewelry and Old Hollywood glamour, Elizabeth Taylors’s White Diamonds perfume has been the top selling celebrity perfume since 1991. Even since her 2010 death, the perfume makes $200 million worth of sales each year. Taylor wasn’t the first celebrity to create her own perfume. In 1957 Givenchy created a scent for Audrey Hepburn called L’Interdit, that was only released after Hepburn had worn it a few years. French actress Catherine Deneuve and Italian actress Sophia Loren both had perfume scents at one time that are no longer sold, according to a Jezebel article. 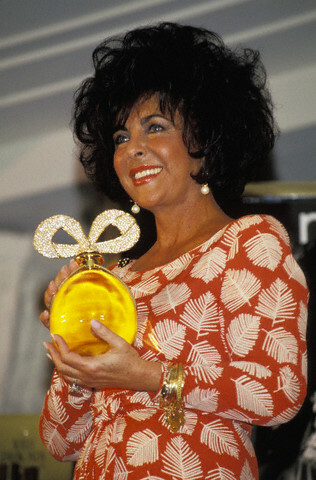 But what sets Elizabeth Taylor’s perfume apart is the fact that is still sold after 20 years. Ever since I was a child, the gold liquid in Taylor’s rhinestone incrusted bottles intrigued me. But my mother warned me White Diamonds wasn’t the most pleasant smelling perfume. Since Mom isn’t a perfume wearing woman, I hoped she was wrong. Recently, with Comet’s beauty tips in mind, I picked up a small bottle of White Diamonds and felt slightly glamorous that I owned an Elizabeth Taylor product. But the day I wore White Diamonds, I felt anything but glamorous. I actually felt ill, because it smells terrible. I sprayed my wrist once and overpowered by the smell. As I gagged, I tried to figure out how this perfume had such a strong staying power. I wonder if it’s simply that it is put out by one of the most important actresses and pop culture figures of the 20th century. To Review: White Diamonds is a very heavy and strong scent. I personally didn’t like it and can’t imagine wearing it all day. I think Elizabeth Taylor’s excellent marketing and Old Hollywood sophistication is what has kept it on the shelves for over 20 years. Have you ever tried wearing it? What is your opinion? This entry was posted in Beauty Tips and tagged Elizabeth Taylor, Elizabeth Taylor perfume, White Diamonds by Jnpickens. Bookmark the permalink. Elizabeth Taylor had a *fabulous* cologne called Black Pearls. It was the follow up to White Diamonds and I adored it. Reminds me of sandalwood. I have hoarded a couple bottles of the body lotion in a drawer in my closet, taking it out only on special occasions. Yet Black Pearls didn’t sell and was discontinued, while White Diamonds is still going strong. So what do I know? I love Black Pearls too!! I wish I knew why it was discontinued, or why it flopped so badly. Do you remember its release? Did it get bad reviews? Some women feel more secure with a strong scented perfume and this is why White Diamonds has endured. I tried White Diamonds on, just spritzed it on my wrists and thought how awful it was. Part of me was glad because I didn’t want to get hooked on a new perfume. Later in the day, I smelled my wrists and thought ‘this is nice. Which perfume did I try on?” I had forgotten that it was White Diamonds. It wasn’t until that evening after smelling it again that it hit me that this lovely fragrance was that disgusting stuff I sprayed on in the morning. I then bought a small bottle to have and use it lightly. Sometimes fragrances smell better once on and allowed to ‘breathe’. But Elizabeth was also a great showman and marketer. I completely agree. I remember when this first came out. First, everyone was blown away by how gorgeous Liz looked in the ads and commercials (she had recently slimmed down a lot). Second, it was unusual for such a huge star to put her name on a product that was easily available to the masses. That being said, I am glad it made her a lot of money, because it smelled – sadly – cheap. I sell fragrances (not W.D. thankfully) and I can explain the reason White Diamonds sells so well: Elderly Ladies. For some reason on an older woman, White Diamonds doesn’t stink so much. It must have something to do with body chemistry, but believe me, they make it work. It’s also beloved because it’s strong so the aging nose can still smell it all day. White Diamonds also carries classic items in the line that most modern fragrances do not, i.e. bar soap, body powder and deodorant. Hope this helps explain La Liz’s success! Oh, honey. I’ve been there. When Debbie Gibson was big, she came out with a perfume called “Electric Youth.” I begged my parents for it. It was HORRIFIC. But I had to have it. Debbie was so big. I dressed like her, tried to sing like her, and now…I wanted to smell like her! Anyway, it came out in this glass tube so it easily rolled off things. Well, it rolled off my dresser and broke. The smell. I think it took a month to get it out of my room.